As the powerful Jet Boat speeds upriver, making their way into the breathtaking stonewalled canyon that is the Niagara Gorge. The anticipation builds as the boats splash into the whitewater of Devil's Hole Rapids. 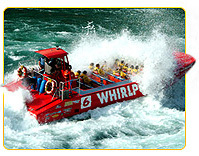 The Jet Dome departs daily from Niagara-on-the-Lake as well as the Niagara Glen (during June, July and August). Passengers for this trip must be at least 4yrs of age and 40inches in height. The tour begins with the windows in the upright/open position, and we use the hydraulics to give passengers unprecedented views of the river, gorge and other boats. When going through the whitewater, we close down the hatches to ensure everyone stays dry. A big bonus for this trip - Bring your Cameras! Put on your head set and listen comfortably to your river guide commentating on points of interest, the geography, history and scenery, as well as how these jet boats work. As well, the captain will offer their observations from the control seat!